NASA – The Cygnus spacecraft was launched by the Orbital Sciences Corporation Antares rocket on Sunday, July 13, 2014, at NASA’s Wallops Flight Facility in Virginia. The Cygnus spacecraft carried 3000 pounds of supplies to the international space station. This includes science experiments, experiment hardware, spare parts, and crew provisions. This is the second contracted cargo delivery flight to the space station for NASA by Orbital Sciences Corporation. The cargo ship was launched NASA’s Wallops Flight Facility in Virginia at 12:52 p.m. EDT by Orbital’s Antares rocket. Orbital Sciences Corporation had concluded a $1.9 billion Commercial Resupply Services, or CRS, contract with NASA and this is the second in a series of future resupply missions. 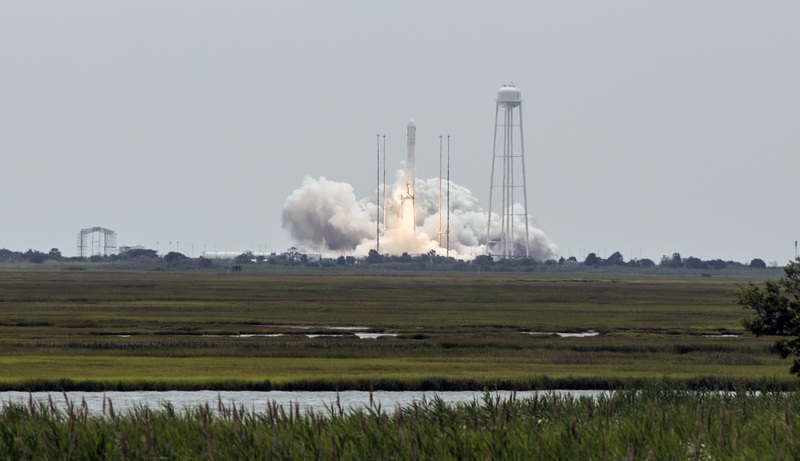 “Today’s mission was the fourth successful launch of Antares in the past 15 months and the third deployment of Cygnus in less than a year.” David W. Thompson, Orbital’s president and CEO, said in a statement. The Cygnus cargo logistics spacecraft will be docking with the ISS on July 16 at approximately 6:39 a.m. EDT. The cargo ship will be delivering 3,669 pounds of cargo meant for the Expedition 40 astronauts. The cargo ship will remain attached to the space station for about 30 days before returning to Earth carrying 2,950 pounds of disposable cargo. Under the CRS contract with Orbital Sciences Corporation, Cygnus will deliver nearly 44,000 pounds of cargo to the ISS over eight missions through 2016. The cargo will consist a variety of goods wjhich includes food, clothing, crew supplies, spare parts and equipment, as well as scientific experiments. Orbital Sciences and SpaceX are the two companies which NASA has hired post the retirement of Space Shuttle to carry supplies to the ISS. SpaceX had delivered cargo to the ISS in April. NASA is paying $3.5 billion for these resupply missions to both companies.